"We have to bear in mind that Demkowska was working under very different circumstances: behind the Iron Curtain and without access to Google." 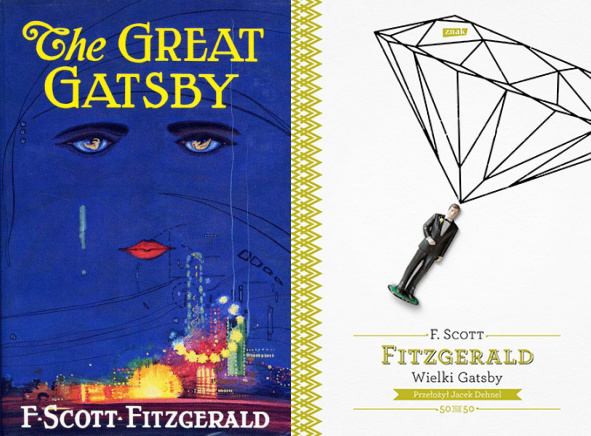 Asymptote Blog is celebrating The Great Gatsby’s 89th anniversary with two essays dedicated to Gatsby, translated: what does a seminal work of 20th-century Americana look like outside the tight nexus of American lit? This essay, first in a two-part series, focuses on rewriting Gatsby in 21st-century Poland. Exactly half a century divides the first (and, until recently, the only) Polish translation of The Great Gatsby by Ariadna Demkowska that saw several editions from my new version (a second translation, by Jędrzej Polak, was issued only once). Until now Poles unable to read F. Scott Fitzgerald’s work in the original had only Demkowska’s translation to rely on. I myself read the book as a teenager when it first appeared in Czytelnik’s Nike series. When Znak approached me to commission a new translation, I accepted but then remembered Demkowska’s version and was initially annoyed with myself because, though working on Fitzgerald’s book was a great honor that promised the pleasure of communing with literature of the highest caliber, I was going to devote my time and attention to duplicating work that had already been done well. However, the more I got into my own translation and delved into The Great Gatsby the more I realized that my effort was by no means wasted. The issue is not, as in the case of many translations going back several decades, one of outdated language; in that respect Demkowska’s version holds up rather well (apart from the word “bootlegger” which, while current in Polish tabloids of the interwar period, has since fallen out of use and I replaced it with “przemytnik alkoholu” [i.e. “liquor smuggler”], this being a rare case of an English import disappearing from Polish usage), and is still a fluent and enjoyable read. As you might expect from the good old Polish school of translation. However, she did make some major changes. First of all, we have to bear in mind that Demkowska was working under very different circumstances: behind the Iron Curtain and without access to Google. It was, therefore, more difficult for her to track down various details, such as those concerning well-known financiers or popular culture starlets of the 1920s. Sometimes she tried to give the readers a better idea of these characters by adding a gloss (for example, when the elder Gatz says that his son, “if he’d of lived, he’d of been a great man. A man like James H. Hill,” Demkowska expands this to ‘a man like the James J. Hill, the financier to whom we are indebted for our railroads’ [AD: “takim jak ten finansista James J. Hill, któremu zawdzięczamy nasze koleje”]. On other occasions she simply omits a detail: a girl “moving her hands like Frisco” (JD: “dziewczyna wymachująca rękoma jak Frisco”) simply “waves her arms” (AD: “wywija rękoma”). In my translation I decided to preserve all the original references that no longer mean much to today’s readers and give footnotes; after all, Fitzgerald scholarship is a constant “work-in-progress,” which means that some of his allusions have been identified only relatively recently: for example, he ascribes Richard Strauss’s “Thus Spake Zarathustra” to a character called Tostoff. She also standardized the characters’ speech. For instance, Meyer Wolfsheim has a poor command of English: on the one hand, full of bombastic phrases and on the other with many phonetic and syntactical errors, such as “gonnegtion” for “connection,” “sid” for “said,” and so on. Demkowska’s translation ignores these peculiarities of his language, no less than his errors of fact (he claims that Oxford, or “Oggsford,” is a college rather than a university). Demkowska apparently regarded some similes or comments as too bold or inappropriate. A jealous woman who appears at a party at the side of her flirting husband like an “angry diamond and hissed” (JD: “jak syczący diament” – “like a hissing diamond”) simply hisses “like a snake” (AD: “syczy jak żmija”). While in Fitzgerald black people roll the “yolks of their eyeballs” (JD: “przewracają „żółtkami oczu”), Demkowska has them “rolling the whites of their eyeballs” (AD: “przewracają białkami”). When Nick arrives in Wolfsheim’s office, he is received by “a lovely Jewess” (JD: “ładna Żydówka”); in her translation she becomes a “lovely girl” (AD: “ładna dziewczyna”). The first translation of The Great Gatsby is an excellent book, thanks not only to the power of the original, but admittedly also the translator’s excellent work. Nevertheless, it seems to me that after living with a conventional translation for half a century it is worth re-reading Fitzgerald’s work in its wilder, slightly less easily accessible form (and one that undoubtedly isn’t free of errors, distortions or mistakes either, for which I offer my most sincere apologies), one that is full of allusions and linguistic oddities; in a word: a work distinguished by a unique style which has assured The Great Gatsby a firm place in American and world literature. Jacek Dehnel (b. 1980 in Gdańsk) is a poet, writer, translator, essayist and painter. He has published seven volumes of poetry, four book-length translations (including of Philip Larkin, F. Scott Fitzgerald and Edmund White) and seven works of fiction (two collections of short stories, two volumes of essays on photographs and maps, a collection of novellas and two novels). His latest novel, Saturn, was published in English by Dedalus Books in a translation by Antonia Lloyd-Jones. He has been awarded, among others, the Kościelski Prize (2005), the Passport prize of the journal Polityka (2006), and is a three-time nominee for the Nike literary prize. He lives in Warsaw. This text first appeared as a Translator’s Note to the new Polish edition of The Great Gatsby.